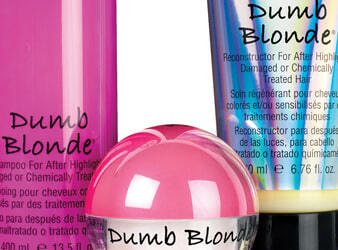 Care for your processed hair with the TIGI Bed Head Dumb Blonde collection. Not just for Dumb Blondes but for all the colours in-between. Whether bright blonde, racy red, or buxom brunette, protect and retain your hair colour with this gorgeous range. Especially designed for after highlights, damaged or chemically treated hair the Dumb Blonde shampoo offers a lather explosion on application it delivers mega-moisture to fragile hair types and adds super shine.